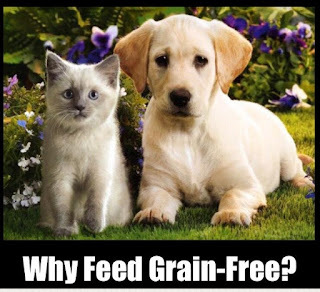 Why Feed Your Pet A Grain-Free Diet? Why are grains found in pet food? Cereal grains are durable and when chemical preservatives are added, have a very long shelf life. Grains contain some protein but are exceptionally high in starchy carbohydrates. They can be easily mass processed and used as "fillers" in pet foods to add calories and protein at a fraction of the cost of adding meat, fish or poultry. Even organic grains are overprocessed and high in carbohydrates. Bottom line: pet food brands include grains to provide calories and boost the protein level while minimizing the cost of expensive animal proteins. Why are grains problematic for pets? Cereal grains can cause inflammation and an allergic response in many pets. Symptoms of an allergic or inflammatory response can manifest in different ways. A dog might be scratching and itching and a cat might be vomiting. Grains are high in starchy carbohydrates which can contribute to yeast overgrowth, a weakened immune system, diabetes and even cancer. Feeding a high moisture, hypoallergenic, low carbohydrate diet such as a raw frozen diet is preferable and can eliminate a lot of the health symptoms you may be seeing with your pet that is eating a dry food with grains. Remember, cats are carnivores and have no use for carbohydrates and dogs fare best on a low carbohydrate diet. But aren't grains ok if they are organic? Many pet owners assume feeding ingredients such as organic brown rice, organic barley and organic millet are beneficial for their pet because they are "organic". Organic grains are much better suited for a vegetarian animal such as a rabbit, horse or cow. Grains, even if organic, present the same health issues for cats and dogs as any other grains. A grain-free diet is often not a carbohydrate-free diet. Many pet foods will remove the grains only to replace them with other high carbohydrate ingredients such as potatoes, rice, and peas. This is why we don't recommend feeding your cat or dog dry kibble. To learn more, please read our article Facts You Should Know About Dry Dog Food and Cat Food. Over the years, we have seen dogs and cats feel best eating a combination of any of the following: frozen raw diets, canned food diets, freeze dried raw diets, homemade vegetables and/or lean proteins mixed in. Have a question about your cat or dog's diet? Please visit www.AskAriel.com and review our complete library of pet nutrition articles.